As printing technology and capabilities continue to advance, wall murals have emerged as an increasingly popular design trend in homes, offices, and public spaces. Because murals are capable of filling most any amount of space, they are a natural choice to decorate large areas that may have otherwise gone unadorned. But beyond simply filling space, with some forethought and a touch of creativity, wall murals can be incorporated into architectural and design schemes in a truly transformative way. 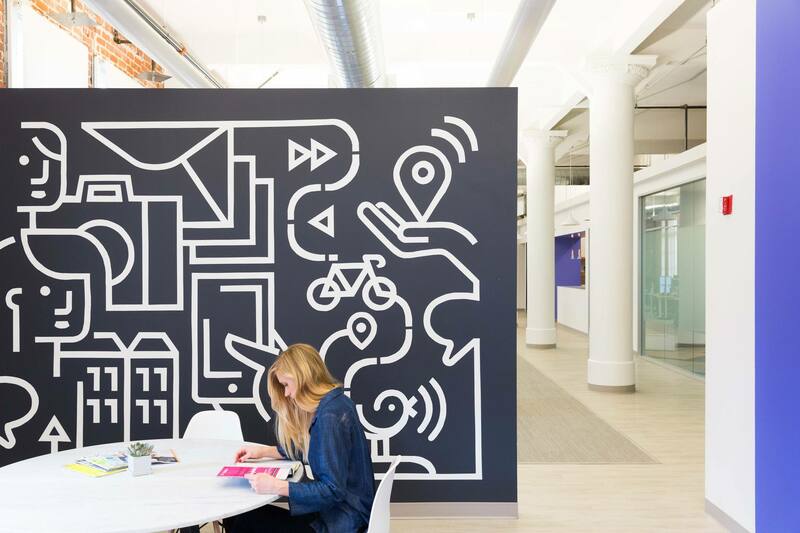 Tech companies tend to be among the early adopters of design innovation, so it’s no surprise that several such companies have used wall murals in their offices to serve stunning thematic and spatial functions. 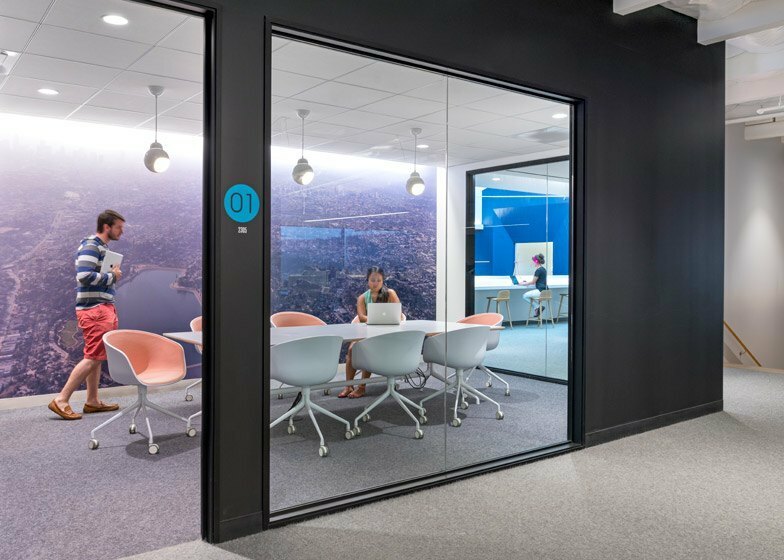 Take a look at the way these workspaces all use wall murals as way more than just simple decoration. Seeing as many companies make their homes in expansive warehouses, the question of how to break up the space is an important one when designing an office layout. Open floor plans are widely embraced for the sense of community and approachability that they foster, but some division of the space is necessary for meetings, breaks, or when productivity could benefit from a change of atmosphere. 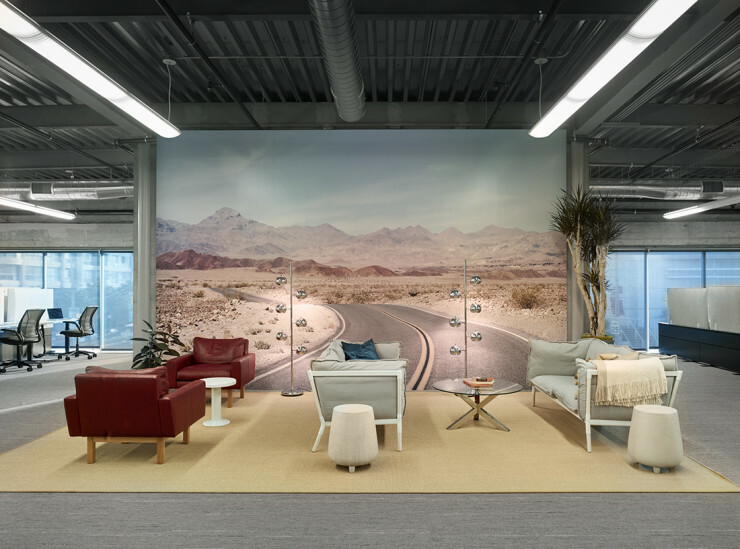 Open floor plan meets the open road at Metromile, based in San Francisco, CA. Installing murals in strategic places in an office can create a sense of delineated space while still maintaining an open air feeling. There is no need for a mural to be as high as the ceiling, or to be enclosed by other walls. They provide distinction without needing to build out a whole room. Just the right amount of privacy at Vurb’s San Francisco headquarters. Sleek lines and and a subdued color palette may make for an ultra-classy and professional look, but a workplace without any flavor or unique additions can start to feel sterile. 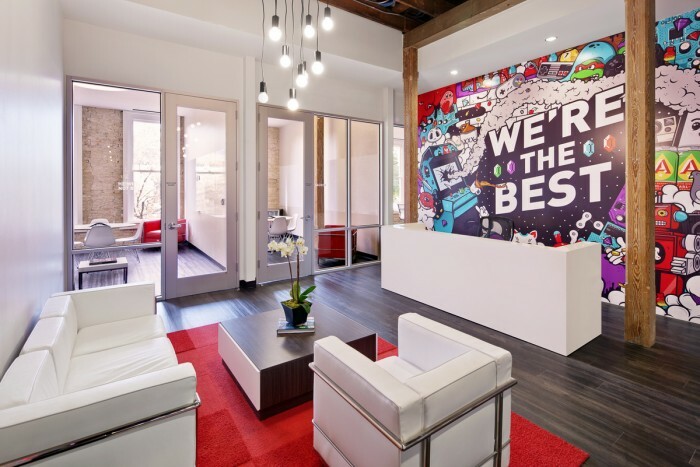 Where simplicity, elegance, and functionality are top design priorities, the addition of murals can introduce just the right amount of character to an office space. Murals need not serve only as backdrops. With the right materials, a decorative mural can double as a functional source of lighting. 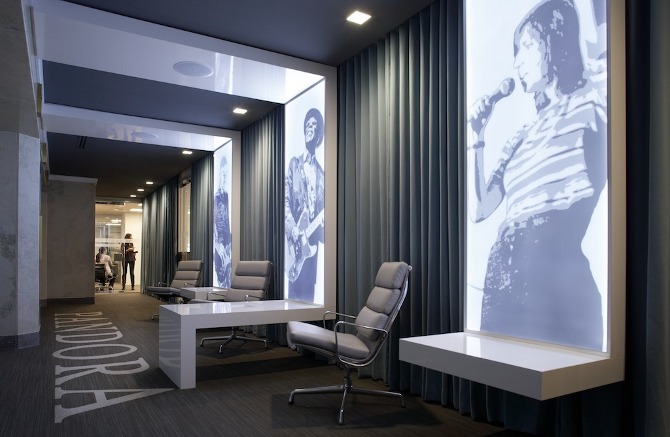 Streaming radio service Pandora features portraits of music icons in their Chicago office, backlit to illuminate the worksurfaces below them. 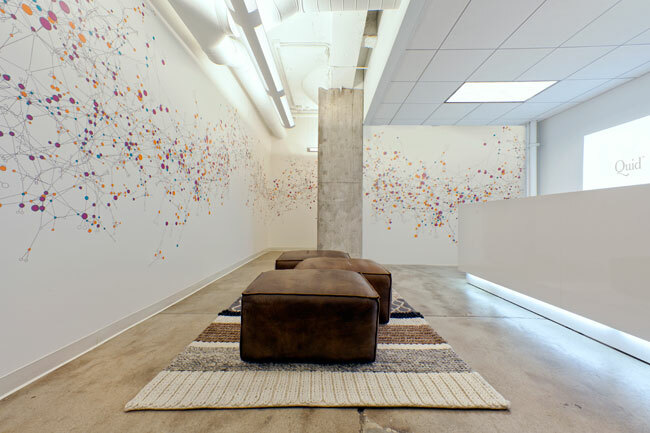 Inspiration and illumination in Pandora’s Chicago, IL office. The right lighting on a wall mural can also give it the appearance of a huge window with an impressive view. 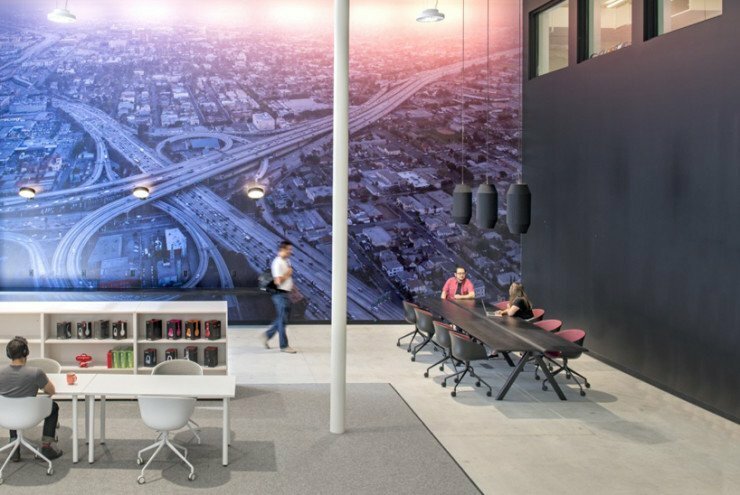 Beats by Dr. Dre’s HQ in Culver City uses sprawling cityscapes as the images for their murals. By strategically lighting the horizon of the photos, the murals have the life-like feel of looking out from a skyscraper. A permanent sunset view at Beats by Dre’s Culver City, CA office.